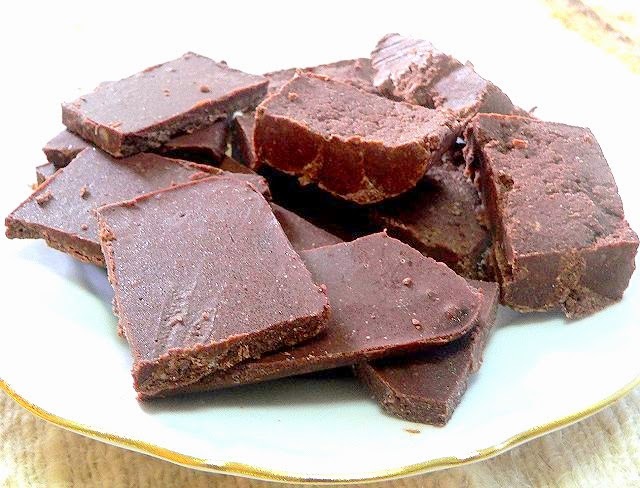 Fudge Recipe #1 (Fudge is pictured foremost in photo) - First time I made this recipe for Splendid Low-Carb Desserts, one of my older cookbooks, I was blown away by how similar to real fudge it was in texture. Amazing! or sucralose - main thing is that it must taste sweet to you! In double boiler, over medium heat, melt cocoa butter, chocolate and coconut oil. Stir in milk powder, Splenda, OR Stevia packets (or use the combo suggested) and salt. Pour into 9 x 5 x 3 inch loaf pan. Freeze until hard. Keep at room temperature or in the refrigerator for longer storage and for more of a snap when biting into it. Helpful Hints: Cocoa butter may be melted in the microwave oven in covered cereal bowl - about 2 minutes. Pour boiling water over chocolate in cereal bowl. When soft, pour off water and add melted cocoa butter. Fudge Recipe #2 (Fudge pictured behind in the photo) - This has a stronger chocolate taste than the former recipe...this one is also very fudge-like! In double boiler, melt chocolate and cocoa butter over medium heat. In cereal bowl, melt coconut oil and butter in microwave oven 1 minute. Stir in cream. Stir in 1/2 cup whole milk powder or skim milk powder and Splenda, OR Stevia packets (OR the combo suggested). Add sweetened milk mixture to melted chocolate mixture in double boiler; sitr. Remove from heat and stir in vanilla or chocolate whey protein and 1/4 cup whole or skim milk powder. Spread in 8-inch square glass baking dish. Press out evenly with back of soup spoon. Freeze. When frozen solid, store in covered container either at room temperature or in the refrigerator. Helpful Hints: Powdered erythritol is available at Netrition.com. I found my whole milk powder at Costco and in a health food store. It works a little better than the skim milk powder in creating a fudge-like consistency.